Dive Courses for Children in Bali. SCUBA dive as a family! AquaMarine Diving – Bali offers several PADI dive courses for children between the ages of 8 and 14. We feel it’s important that families have an opportunity to share their passions and hobbies, and what better way than to get your children in the water? Keep in mind that we have designed a holiday package based around this idea; take a look at how to integrate diving courses into your family holiday. As always our primary focus is safety with an element of fun so your children are in safe hands with us. The Junior Open Water Diver Course through to the Junior Rescue Diver Course are all based around adult courses in terms of numbers of dives and skill requirements so you may see a repeat of what you’ve read in the adult course summaries. The PADI Bubblemaker course gives your little angels the chance try SCUBA diving to a maximum depth of 2 metres in the safe confines of a swimming pool. 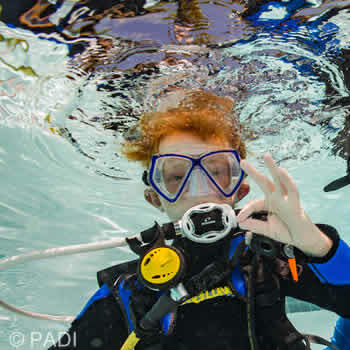 The PADI Junior Open Water Diver is exactly the same as the PADI Open Water Diver course but with a 12 metre maximum depth for the 10-11 year olds. This SCUBA diving course certifies 10-14-year-olds to always dive under the supervision of a PADI professional. PADI Junior Open Water Divers can experience more varied underwater adventure with the PADI Junior Advanced Open Water Diver course. Junior divers can develop their confidence and self-sufficiency in the water as well as following all aspects of the adult Rescue Diver Course with the PADI Junior Rescue Diver course. The theory for many PADI courses can be done online and this is an ideal way to learn. It is entirely flexible for those with busy schedules and you can commit as much or little time to it as you would like. It’s also a great way to improve your knowledge of diving during the times you are not diving: With PADI eLearning you don’t have to wait until your next dive to improve your diving knowledge.